Flying courses in all aviation colleges give special attention to flight training. In an outline, this is the part where aspiring pilots apply or practice everything they have learned from manuals, lectures, tutorials, and demonstrations. At this point, all acquired theoretical skills are put to a test. Hence, this is the gauge of how effective flight training schools have been in mentoring aspiring pilots to be what they hope to be. To get inside an aviation college, one must be at least 17 years old with a high school diploma upon application. Flying requires a lot of calculation, assessment, and decision-making therefore many schools require a minimum academic average to comply. Likewise, an applicant must also submit to a Class 1 pilot medical exam. This includes a review of one’s medical history, hearing and vision tests, blood and urine tests, and a general physical exam. Flying hours are essential to passing a flying course. Before getting one’s hand on an aircraft’s steering wheel, a lot of skills should be theoretically acquired along with a vast knowledge of how various air borne transportation works. The general purpose of flight training is to put into practice and enhance airmanship skills, consequently learning how to pilot an aircraft. While there are flying schools that offer the same services, there is a huge advantage in choosing a Federal Aviation Administration (FAA) approved aviation college. FAA issues pilot licenses provided an applicant meets the set standards. 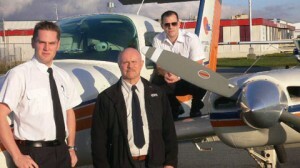 Flight training schools rent aircrafts to students and provide them with qualified flying instructors. Before a student could take off, extensive ground training is conducted. This training along with a written exam is some of the requirements in owning a license to fly. Assisted and solo flight hours have to be completed as well depending on the type of pilot license applied for. Finally a flight test conducted by an accredited FAA trainer will determine the readiness of an applicant to fly. A private pilot license requires 40 hours of completed flights. This type of license enables holder to fly for leisure and hobby without compensation. Pilots who want to be compensated must complete a total of 250 hours of flight to qualify for a commercial pilot license. This license allows holders to be compensated each time they fly a small passenger or cargo plane. What people are more familiar with are the airline transport pilots. Only pilots with this license are hired by major passenger airlines. More training and familiarization of bigger planes are asked for aspirants. License requires a total of 1500 hours of completed various flights. For non-pilots, seeing the experts maneuver different aircrafts seems easy. Many aspire to fly to earn a more than decent amount. A closer look at what goes on inside aviation colleges will make one think otherwise. 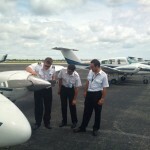 Flight training schools do not just require a big amount of investment. Whether one wants to fly for pleasure or for a career, the runway to take off is a difficult path.